Make a sample ‘precious pot’ so the children know what they are making. 1. Place your beaker upside down and lay your square of foil on top. Carefully press the sides of the foil down so that it forms the same shape as the bottom of the beaker. The shape should fit snugly over the beaker. Wrap a piece of sticky tape (preferably double-sided) around the foil at the level shown by the arrow. 2. Remove the foil shape and turn it the right way up. Carefully cut away the excess foil above the sticky tape. Make sure you don’t crush your precious pot at this stage. 3. 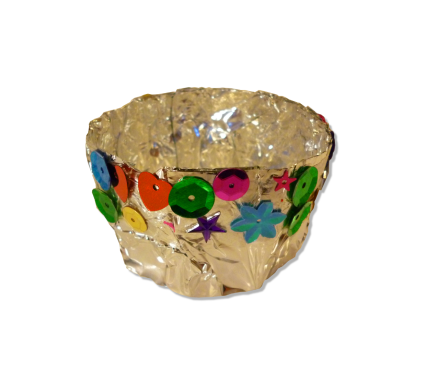 If you have used double-sided tape gently press sequins onto the tape to decorate your pot. If you have used single-sided tape you will need to use PVA glue to stick the sequins to the tape.